Monday morning brings some pretty awesome news to the world of overclocking. The Chief Reporter at HKEPC recently posted on Facebook that Skylake was much funner to overclock than Broadwell after reaching 5.2 GHz with the flagship chip. The even more impressive news is that he did this on air. There’s a couple of considerations to take in with all of this but at the moment, this looks like some incredibly exciting news for overclocking enthusiasts who are considering the upgrade. This sounds pretty huge, but we need to consider a couple of factors before we take this as a guarantee of what’s to come. First of all, while the source seems like someone who’s very trusted in the hardware industry, it’s important to note that we don’t have any word on the specific cooling used or verification of stability. While an NH-D15 is considered air cooling, it isn’t the kind of accessible solution that everyone has. Also, we all know that while you may be able to boot into the OS, it doesn’t mean you can pass a stress test or even load a reasonably heavy application. The other bit of info missing is the core temp. While the temperature is said to be within specification, that doesn’t mean we want to see our core temps raising up above the 70’s all the time. However, these are just some considerations to keep in mind and since the source seems like a credible one, let’s get back to what makes this exciting. This is a 5.2 GHz overclock on air cooling! That’s huge and when you do the math, you figure on a 30% increase in clock frequencies. I know I keep bragging about this but that’s excellent! The other good news is that this was done with a voltage of 1.35V. Once again, we can’t guarantee whether there are any discrepancies with monitoring software, but that is a great sign. If everything is as up front as it seems, than my guess is we’ll be seeing overclocks in the 5.4-5.5 GHz range with more high end liquid cooling. Why is the overclocking so good? 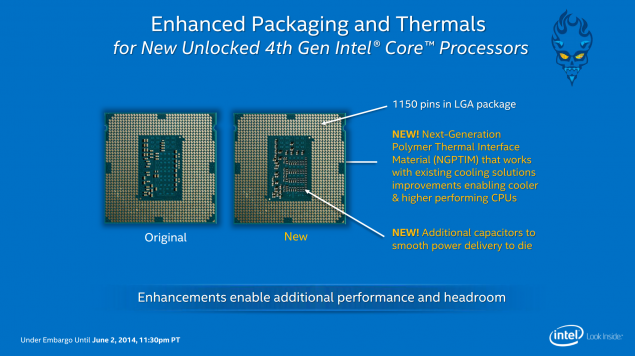 Of course we know that INTEL is using the new 14nm manufacturing process with new architecture, but there’s something else that seems to be adding to this new performance. INTEL added new capacitors on the die to help smooth the power delivery. At first glance this seems like a tiny change, but if reviews start showing similar, or even better, results to what we’ve just seen, than it looks like team BLUE has hit the bulls-eye with Skylake. So there you have it. This upcoming release from INTEL is shaping up to be an overclocker’s dream. Once again, we have to keep some considerations in the back of our minds while we wait for the reviews, but I’m personally getting very excited about it. Skylake and the Z170 chipset are looking like some serious contenders for the market so we’ll keep you posted as we find out more info. INTEL’s Profit Drops, but are we Really Surprised?